Cantilever arms are designed for mounting outdoor air conditioning units. Our arms come in pairs, and include mounting bolts and washers for the outdoor unit. 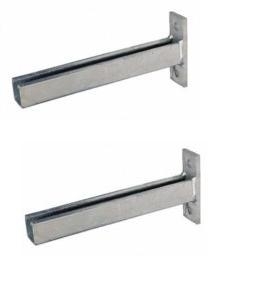 Cantilever arms are galvanized and hot dipped for lifetime corrosion resistance. Two sizes are available, 450mm arms for outdoor units up to 5kw, and 600mm arms for outdoor units over 5Kw.